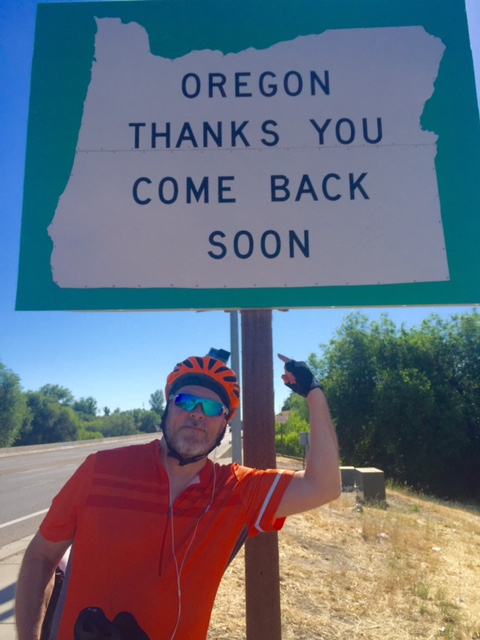 MARK & MELODY UPDATES FROM DAY 11/12/13 – Leaving Oregon, Idaho + Rest Day! MELODY: Okay, I’m going to say it. 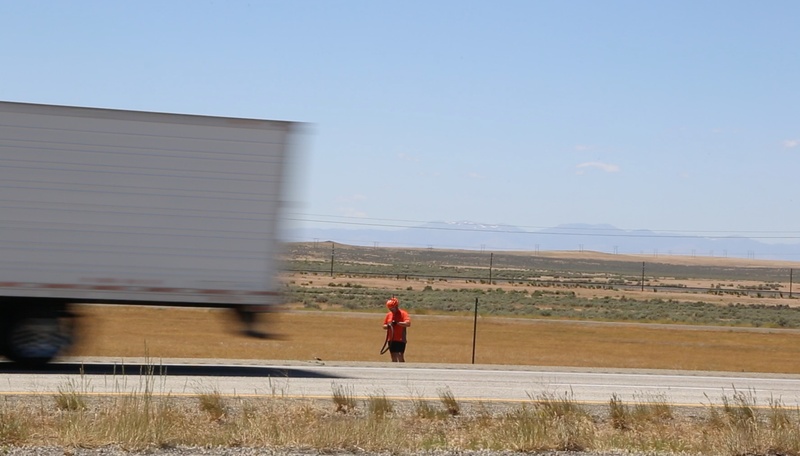 While Mark was whizzing along on Interstate I-84 in Idaho (and yes, it’s legal because it’s the only way to get from Boise to Fairfield), I was trying hard to keep it together. 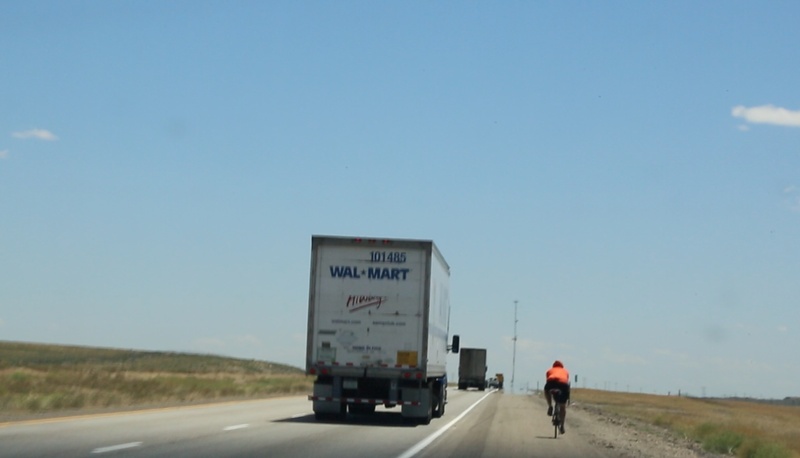 I mean, my husband was happily riding on a major highway where cars and trucks are passing by at 80-90 miles an hour. I’m the one who had to watch. It’s different than riding it. Oh, and then he gets a flat tire, too. And that was only half way through the day! But enough about biking. Mark writes plenty about that. See Mark ride on the Interstate. Not gonna lie- it was scary to watch! For me, the past few days have been more about trying to take in the beauty of the incredible places we are seeing. Sometimes…while waiting for a perfect shot… I don’t really experience the moment. And I want to be better at that. So I am trying. Another thing. Mark is not an easy subject to film. He is always telling me “enough already” or “do you really need to keep filming” which makes it hard because he is my husband and not just a random person in one of my films. It’s a really different kind of challenge. For example, I really wanted to get some shots of him fixing his flat tire on I-84, but by the time I got there he was done and wanted to go. So I missed it and he wouldn’t wait even one second for me to get a shot of the tire. He just needed the pump I was carrying in the car. So sometimes I’m a filmmaker, and other times I’m simply a supportive wife with supplies. It’s complicated. I’m learning how to deal with this and it’s not easy. One of the few pics I have of Mark changing a flat on I-84. Oh, well! On another note, something that has really grabbed my brain this week: I am trying hard to understand the kindness and generosity being shown to us by our hosts at WarmShowers a website for cyclists who need a “warm shower” (and often a bed, kitchen and laundry) while biking at no cost. It’s like couch surfing for bikers. I mean, it makes me wonder…who does this? In the past week, we have had 3 “WarmShowers” experiences: A church lady in Dayville, Oregon let us sleep in the church, use the kitchen and the shower and even provided pancake mix! Marci and Aaron in Boise gave us a fully-equipped apartment above their garage (with a deck!) and invited us to sit outside with them and visit. And now in Fairfield, Idaho, lovely Laura gave us an extra guest house for two days (today is our rest day) — all to ourselves! 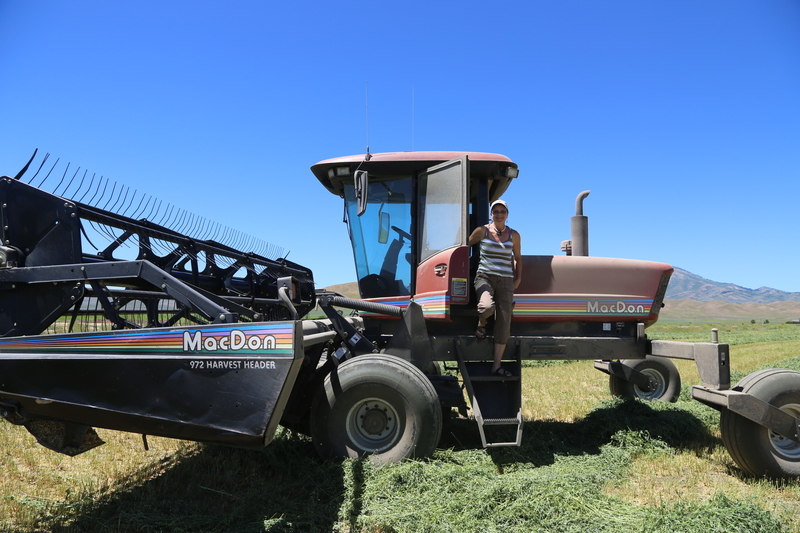 And then she gave us a ride on a Swather while she was cutting hay this afternoon. It is remarkable that people across the country (and the world) simply open their homes to strangers! It makes me feel like there is still some goodness in the world. Laura took us for a ride on her Swather! More flats + More Pie + Doll pics. Bye-bye Oregon! Gee, Tune… do I hear a Warm Showers doc in the making?? Seems to have started with the same question you asked for “Married at the Mall”!